We are engaged in providing a qualitative range of Loctite Family Threadlocker that is made using the advanced techniques. Sledge Lok represent the next generation in thread compound technology and design. Just as oil filled pipe materials and connections are engineered for specific applications and field service requirement, so must thread compounds be formed to meet critical performance requirement. Prevent loosening from shock and vibration. Single part easy to apply. Used on various sizes of fasteners. 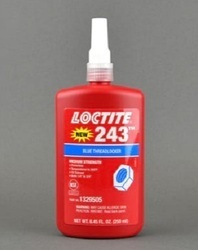 Loctite® 246™ High Temperature, Medium Strength Blue Threadlocker resists oil and mild surface contamination at continuous temperatures to 450°F. Suitable for fasteners between 1/4" and 3/4" (6 to 20 mm) diameters.